According to a statement made by the United Nations Information Center in the Egyptian capital, the JW Marriott Hotel installed a solar power station on its rooftop, becoming the first in Egypt to switch to renewable energy. The solar power station is composed of panels that have a collective capacity of 150 KW. The Global Environment Facility provided the funding for the project, which came as a part of the UNDP and Ministry of Trade’s joint Sustainable Development Goals initiative. The project has been named “Grid-connected Photovoltaic Power Systems – Egypt PV“, which is implemented by the Industrial Modernization Center. The move for renewable energy is growing in Egypt, and the aforementioned project is supporting the expansion of roof-top solar energy systems in commercial, residential, and industrial buildings. In a praiseworthy move, the JW Marriott will become the first facility in the hospitality field to be 100 percent powered by renewable energy. Thus encouraging homeowners and businesses to follow suit, which will further develop, the renewable energy market in Egypt. To commemorate the historic step, a ceremony celebrating the launch was held. 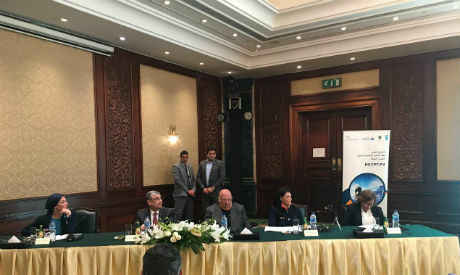 It was attended by a number of high-ranking officials including Mohamed Shaker, Minister of Electricity and Renewable Energy; Rania Al-Mashat, Minister of Tourism; and Yasmin Fouad, Minister of Environment. Those in addition to Ahmed Taha, Executive Director of the Industrial Modernization Center; and Randa Aboul-Hosn, UNDP Resident Representative. The United Nations Development Programme (UNDP) is hoping the Marriott will lead by example and other hotels will follow suite in Egypt. Hence, a major sector will capitalize on the country’s abundance of solar energy, pushing the country onto a greener path.